SORROWS PATH is a Greek Power/Doom Metal band that was formed back in 1993. Two demos came out soon one after the other: “Sorrows Path” in 1994, “Promo” in 1996, made to obtain a label deal. Eat Metal Records then released those two on CD as “Resurrection” in 2006. Four years later, the band’s debut full-length finally sees the light of day. 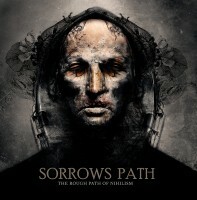 Titled “The Rough Path Of Nihilism” features twelve tracks of powerful Doom Metal and was released in October 2010. Prior to all this, the band underwent line-up changes, military service and so on. In 2008 the recordings for “The Rough Path Of Nihilism” were done with the help of producer/musician/composer Vangelis Yalamas (FRAGILE VASTNESS, JAZZMENT DAY), who apparently has also worked with Duncan Patterson from ANATHEMA, Joey Vera, Ray Alder (FATES WARNING, REDEMPTION). Vangelis can be heard on this album as he contributed with synths and arrangements. All the artwork and photography for this album is by the hands of Seth Siro Anton, who has also worked with PARADISE LOST, MOONSPELL, SOILWORK, EXODUS and more. Live-wise SORROWS PATH shared the stage with SOLITUDE AETURNUS in 2006, the day before the release of “Resurrection”. After that, more support was given to MEMORY GARDEN, PAGAN ALTAR, SCANNER, CRYSTAL VIPER and BROCAS HELM. More recently the Greek stood on the same stage at the Malta Doom Festival with NOMAD SON, FORSAKEN and more. “The Rough Path Of Nihilism” seems to revolve around love, though not in a birds-and-the-bees kind of way. It begins with “All Love Is Lost” and its atmospheric, acoustic intro that sounds very solemn and relaxed. When the clean vocals come in, mixed feelings pop up. On the one hand this move isn’t bad, but on the other… the music was doing fine as it was. Things get Metal with ferocity, as the power breaks out in typical style, reminiscent of e.g. BLACK SABBATH, CANDLEMASS and so on. The clean vocals have a rather psychedelic touch and they contrast very much with the music. Sometimes this works, other times it doesn’t and I have to admit that a rougher voice would have been better. There’s also room for a solo, but it’s not the kind of solo you’d expect when listening to Doom. Hence SORROWS PATH not being a pure Doom band, but adding Heavy/Power Metal as well. All in all, this is not a bad song, but the vocals do it harm. “The Beast (S.P.R. )” is a better song. A symphonic intro creates a scenery of drama and tension. A wailing female voice comes in, after which it’s Doom time with melody and the piano. The whole has a dark and gloomy character. And yes, Angelos’ clean vocals are present, too. The same problem remains: contrast with the music. It’s not that he can’t sing, it’s the timbre of his voice that bothers me. The chorus follows the set out rules: drama and theater. Before the guitar solo, there’s a nice, powerful and emotional instrumental bridge. And then it’s back to business. Another song that can be counted among the better is “Honestly…”. With the organ and the guitars, the feeling of danger and gloom is easily obtained. There’s nothing fast here, the Doom reigns with leads that are a bit Blues-influenced, it seems. The music is power, it rocks, while the chorus is of the hymnic kind. And it’s particularly in the chorus that everything works quite well together. Yes, even the vocals. But then comes “Fetish”, a song I found hard to sit through. Pearls and beads fall to the ground, at which moment the Metal kicks in. Like in “The Beast (S.R.P. )” a female singer can be heard, here in the chorus. The music sounds a bit psycho, chaotic, while the singing (overall) is more vicious. The middle section holds operatic bombast, theatrical madness, so to speak. Still, not really the best song on this release. “Dirty Game”… agony and madness to start with. The music is Heavy Metal with a Doomy touch. The singing remains clean, but is sometimes too high compared to the atmosphere of the song, which does have a catchy chorus. “Mr. Holy” is another dark Doom track, powerful and tight. And it’s nice to hear the bass for a change. “Getting Closer” offers power Heavy/Doom Metal, though again with the contrast between music and vocals. This time it’s really too much. Keyboards add leads, while the chorus isn’t made to lift you up. “Queen Of Doom” begins clean. Galopping midtempo Metal follows, despite this being a sad song, thanks to the symphonic input. A second impression is that this song sounds a bit chaotic, as if too much was crammed into this song, as if the band forced the creation of this song. Or the elements weren’t aligned properly. And a constant in this text is the singing, which follows some odd lines, I must say. “Prostitute” also does not have a direct Doom start, as it’s only vocals and piano to begin with. The Doom (see BLACK SABBATH, CANDLEMASS, and so on) does follow shortly. And I’m not even going to mention the vocals anymore. There are solos, too, indeed. With “Hymn Of Differentiation” SORROWS PATH goes back to the 1970s, in a Doomy kind of way. The verses, however, were given a Folky influence. “Empty Eyes And Blackened Hearts” is all about guitars and music in general. Doom/Power Metal is on the menu and it tastes quite good, I must say. Last but not least, there’s “Nihilism” to end the album with Jazzy Doom/Power Metal. A job very well done. Long story short: another new band for me, these Doomsters from Greece. The music overall is good, yet nothing more. Still, the instrumental talk is more pleasing to the ear than the voice. Again, it’s not the singing itself (i.e. the fact that there is singing on this album), it’s the sound/timbre that, in my humble opinion, is the black mark on the majority of the songs. At times more ballsier or rougher singing is needed, which is probably not Angelos’ style. All in all, “The Rough Path Of Nihilism” isn’t a bad album (it would have been a good EP, though, if you kept only the better songs), but fingers crossed for the follow-up to have rectified some things.